Reliable equipment is vital for Tasmanian contractor, John Holmes. He is one among the nine operators that contract-harvest poppy seeds for GlaxoSmithKline, one of the state’s two pharmaceutical giants. “John and his business partner, Ray Eustace, harvest on average 2,000 hectares of poppies between January and March each year. They work across Tasmania and cut approximately 2.5 tonnes per hectare. “Due to the unique nature of the poppy plant, we’ve only got a small window of time to harvest the seeds, so our gear has to be ready to go when the time is right,” John Holmes said. Poppies are mechanically harvested as straw; however, the harvesting is done using Case IH CVX 170 model tractors rather than combines. 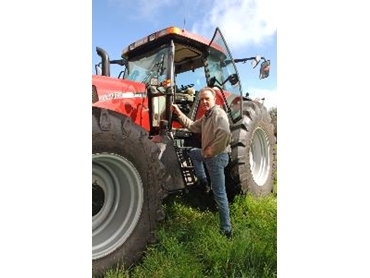 “Due to the nature of equipment attached to the three-point linkage, we operate the tractor in reverse as it means we are looking directly out over the attachments and this enhances our visibility significantly,” John Holmes said. The CVX tractor has two sets of controls – both at the rear and the front. To operate in reverse, John Holmes simply swings his chair around to harvest with ease. Before moving to the CVX range of tractors, John Holmes was forced to modify his tractors to enable them to operate in reverse. The CVX, with its 6.6 litre turbocharged engine and Automatic Productivity Management (APM) system, is ideal for John Holmes’ operation. “This feature also ensures that engine speed is constantly adjusted for the most economical fuel consumption, even at road speeds of 50 km/h,” John Holmes said. The CVX also features Headland Management Control, which means it can store up to 30 headland related operations for two different applications. Along with this, the Continuously Variable Transmission ensures smooth acceleration from good creep right up to top speed, and the active hold (stop) control means the tractor will not roll forwards or backwards, even in hilly terrains or with a loaded trailer.